Our durable Cubbi-Stor storage units and lockers provide personal storage for shared environments. Designed with a clean, modern aesthetic with customizable configurations, our personal storage gives you a secure place to store personal items without compromising the design of the space. Featuring individual locking systems, cubbies or lockers are ideal for personal storage in shared workspaces. 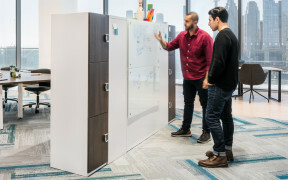 Office Specialty offers many unique and innovative solutions for shared or multi-user workplace environments. Featuring durable locks and quality exterior construction – cubbies and lockers provide peace of mind throughout the day that your personal items are safe and secure. 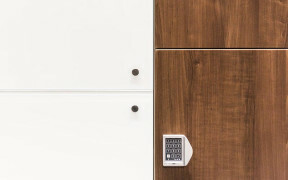 Also, with optional digital locking systems, it makes updating passcodes easy and accessible. Each locker and cubbie is built to suit your storage needs – from lunch bags to gym bags. Find the size that suits what you store and let us make it efficient with a variety of configurations and inserts. We don’t believe storage should have limits – especially when it comes to design. As with most of our products, you have the freedom to choose the fronts and finishes that suit your style.